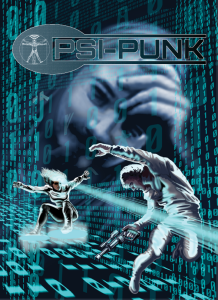 Psi-Punk is a cyberpunk role-playing game, powered by Fudge, written by Jacob Wood and published by Accessible Games. Cyber Settings are all around us and in all of our favorite game systems. This Fudge-Compatible system is no exception, and with Psi-Punk, the setting is brought to a new realm of gamers, that also include those who may have disabilities no matter how severe they are. Accessible Games has a reputation with working RPG’s into those who have severe disabilities and making the games more user friendly for all without making the player feel awkward for having a disability. I applaud their genuine efforts in creating a game that is tailored to those needs and for many it will bring much fun! Presentation of Layout: The presentation of the adventure is definitely of high quality! Layout is nice and clean and everything is readable. Would like a little more color, but that’s just me. Ease of Mobility: The file is easy to navigate and read through. All E-reader users will have little to no problems getting it onto your tablet. However, the additional bonus features will not be accessible in E-book Format. The bookmarks are nice, and great if you plan on running it through your computer. Mechanically, this book is sound. It’s a great way to get into the Fudge Dice System which has been gathering a steady following these past few years. I definitely had fun playing it as well with a few friends, and teaching them the Fudge system versus a lot of other systems that are out there. Mechanically, the longest part will be character creation, but granted, that’s usually how it works in most systems. Once you get going, it’s definitely a win in terms of game play mechanics. If you are looking for a great cyber setting adventure using the Fudge System, Psi-Punk is a great game to turn to. Especially those who want to help your friends who are looking for a way into gaming, but fear their disabilities whatever they may be will be in the way. The setting may not be pleasing to all, but there’s nothing a little tweaking cannot fix. Get it, and get everyone (and I mean everyone) into gaming! I’ve never been really good at doing bios. Even after my many years in the professional scene, I still have trouble with writing about myself. So here I go: My name is Venus De Coy, although in the geek scene I go by either Lady Benihime (Anime, general geek scene) and Lady Ophelia (My gamer tags). Since 2007, I have run an assortment of geeky-related businesses. And although they have been successful, I still felt the urge to go into the “normal” world and do “normal” things. So, I am a nursing professional here in the Northern California area. When not being a nursing professional, I like to call myself a “Professional Geek.” I host panels on educational geeky things and I like to share on how to build your professional image in geekdom, while still being true to who you are. When I’m not being a “professional” geek, I am an avid geek of all trades, with a specialty for gaming. I run my local Pathfinder Organized Play Society group, loves playing video games, board games, table top games and I have recently developed a love for Magic The Gathering. I also love anime, zombie comics/books, conventions, blogging and the World Championship San Francisco Giants.